BBC NEWS | UK | Magazine | Why does Robin Hood keep coming back? Green tights. Pointy cap. Bow and arrow. Russell Crowe is the latest actor to play the folk hero, and Chancellor Alistair Darling has also been cast as Robin Hood for taxing the rich. Why the enduring fascination with this bandit? Nearly 800 years after he first featured in medieval ballads and stories - this mysterious outlaw called Robinhood, Robehod or Rabunhod - the legend now universally known as Robin Hood remains big news. Robin and his Merry Men may be mythical creatures, the stuff of bawdy, beer-spilling folk tales from about 1228 onwards, but they are the most sympathised-with outlaws in history. Best known for stealing from the rich and giving to the poor, Robin (depicted by some as a commoner, and others as the dispossessed Earl of Huntingdon) and his Merry Men (a group of "three score", or 60, outlawed yeomen, according to an early source) have become symbols of justice against greed and tyranny. The band are said to have lived in Sherwood Forest in Nottingham, from where they launched raids on the wealthy and the wicked. Although mentioned in documents in the 13th and 14th Centuries, it is in handwritten, ballad-style narratives of the 15th and 16th Centuries that he really takes shape. In these, most of what we recognise as the stuff of Robin Hood's legend is already in place - his affection for the lower orders, his brilliance as an archer, his suspicion of clerics and sheriffs, his special respect for women (although Maid Marian, Robin's well-known love interest, does not appear in stories until later in the 16th Century). A heady mix of camaraderie, rebellion, rich-bashing, living in the open air and a "will they/won't they?" romance, it's hardly surprising the story remains such powerful fictional fare, particularly on the silver screen. The story received its first screen treatment in 1912 with a silent version, followed, variously, by Errol Flynn's technicolour romp, Disney's anthropomorphic foxes, Mel Brooks' comic take on the men in tights, and Kevin Costner's po-faced Robin whose thunder was comprehensively stolen by Alan Rickman's scenery-chewing Sheriff of Nottingham. Now the wheels of the publicity machine are turning for the latest take, with newly-released photos of Russell Crowe playing the green-clad hero for Ridley Scott. According to reports, it will be a gritty, historically accurate affair - no men in tights, no wistful conversations around open fires, just an armour-wearing, lightly bearded Crowe launching bow-and-arrow attacks on his ruthless enemies. The appeal of the story to Hollywood as an action romp, good v evil affair, is clear. But might there be more to it than that? Was Robin Hood also a proto-socialist figure, even a very early one-man version of the welfare state, whose theft from the rich and provision to the poor encapsulates a deeper human desire for equality? Might that explain why, at a time of recession and widespread criticism of "greedy bankers", it's expected that we will lap up another film? At the same time, the BBC's Robin Hood is now in its third series. And just as the new President of the United States has been renamed "Barack Robin Hood" by a leading American economist for his various bailout initiatives, the UK's Daily Mirror and Daily Telegraph depict Alistair Darling as the folk hero after he hiked the top tax rate in Wednesday's budget. 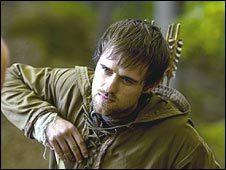 Thomas Hahn, professor of English at the University of Rochester, and author of numerous essays and books on Robin Hood, says the character's popularity has long represented people's frustrations with life in capitalist society. "Robin Hood's appeal arises from primal desires for justice and equity," he says. "And though medieval in origins, this is a fantasy broad and deep enough to possess the imaginations of people in almost all times and places." It's telling that the legend really sky-rocketed in the 16th and 17th Centuries - an era of the "earliest capitalist enterprises", says Prof Hahn - amongst ordinary people who found new economic systems alien and oppressive. "His independence and anarchic resistance to all forms of authority - from corrupt local officials to the clergy - stood out against the expansive, complex, mysterious economic networks. "Today, connecting Robin Hood to bailouts or demands for pay cuts [for the rich] draws upon the same suspicions and unease that his earliest readers and listeners felt about economic systems which, in far exceeding any common-sense experience, seemed out-of-control, oppressive and threatening." But name-checking Robin Hood in debates about policy - whether on social justice, welfare, tax rates or bailouts - misses the essentially anarchic character of his legend. "In the best retellings, Robin Hood almost always represents the opposite of 'policy' or rationalising our financial behaviour," says Prof Hahn. 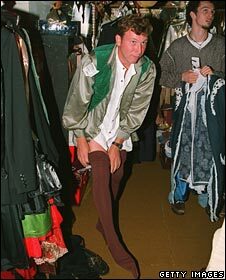 "The Monty Python sketch gets it exactly right when it has a beleaguered Robin, having tried to develop a systematic programme of stealing from the rich and giving to the poor, say: 'You know, this redistribution of wealth thing is considerably harder than it looks.'" Rob Killick, a company chief executive in London and a writer on the recession, thinks the resurgence of Robin Hood isn't necessarily a good thing. Instead, it captures the low horizons gripping us in this economic downturn. "Characters like Robin Hood have existed across culture and history, fulfilling a need for the helpless and hopeless to believe that someone is on their side." Yet today's Robin Hood-style attack on bankers and fat cats is problematic, he says, because it can shut down serious debate about the recession, and super-simplify issues in terms of "good" and "evil". Dr Julian Luxford, an expert on medieval writing at the University of St Andrews, also sounds a note of caution on the legend of Robin Hood. He recently caused a media storm when he uncovered a document, from the 1460s or 1470s, which described a Robin Hood who "infested Sherwood" with "continuous robberies" - suggesting he was not always so popular. 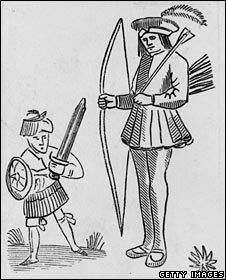 "Lack of provable historical status makes Robin Hood particularly malleable," says Dr Luxford, "And different ages and interests have fashioned their own Robin Hoods accordingly". Indeed, he points out that, even as Barack Obama and Russell Crowe play heroic Robin Hood roles, "a new novel, casting Robin as a brutal murderer, is soon to emerge". Robin Hood keeps coming back when the poor need justification for robbing the rich. Any Rand shed light on this in Atlas Shrugged. I'm indifferent in regards to how I feel about that story, optimists will be inspired by it, pessimists or realists will look for the truth behind the myths. What's more important is that Russell Crowe is back doing the one thing he knows how to do well... altogether now... Fighting round the world! I had always understood that Robin Hood was written about (and during) the reign of Richard II, but many were afraid to speak up about the weak king and his venal servants. So rather than upset the current king, popular story-tellers set it 200 years earlier - and it resonated with the populace because it made sense of their current woes. The best fictional portrayal of RH is in TH White's The Sword and the Stone. 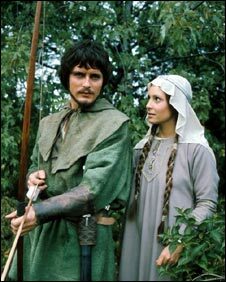 There Robin is a middle-aged, quiet woodsman who rescues hapless prisoners from Queen Morgan's tower with the help of Wart and Kay. Robin is, of course, not Hood but Wood. I fear your Professor Hahn suffers from a delusion. 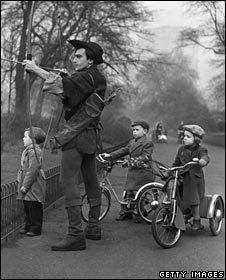 Robin Hood represents the Englishman's natural loathing of authority, power and the associated corruption that brings sycophancy, greed, nepotism and self-interest. To equate this to capitalism and socialism is a neo-Marxist dream. As an academic he should be thoroughly ashamed of shallow, modish analysis that defies an understanding of British history at any period from the conquest onwards. To see the medieval Robin Hood as a "proto socialist figure" is wrong. If you read the original ballads and stories, there is indeed plenty of robbing from the rich, but very little giving to the poor. Robin and his merry men are very much out for themselves. There's also some pretty shocking violence, including mutilation of corpses and child murder, and it's not always carried out by the "villains". Taken in their own context, their appeal probably lies more in them being opponents to unpopular civil and religious authorities. Surely his role was quite the opposite: he was the opponent of oppressive over-taxing big government. He stole from the beneficiaries of a corrupt tax system to return wealth to the unfairly taxed masses that they might use it productively. In translating this to modern times, there is a twist. The beneficiaries of the taxes in Robin Hood's day were the nobility and their various hangers-on, whereas today our taxes are squandered on welfare dependents and employees of public sector make-work schemes. Today's Robin Hood should steal from the welfare claimants and public-sector payrolls and give to the productive middle classes. I'm a Notts girl and will always be proud of our legend - I firmly believe he was a good guy trying to stop the injustices against the poor. No matter how the media use him, Robin Hood will always be our hero. Incidentally I was pretty miffed at the naming of the Doncaster Sheffield Robin Hood airport. It's in Yorkshire! Robin Hood was born in Loxley (sometimes spelt Locksley) which is in Hallamshire, near Sheffield, Yorkshire - hence the naming of the airport and that he is often known as Robin of Loxley. However, I believe there are some documents describing Loxley as being in Nottinghamshire due to boundary disputes on the Hallam Moors. Re "a new novel, casting Robin as a brutal murderer, is soon to emerge". And perhaps it will be titled: Robin Hood: The Dark Tights. Robin Hood, like Jesus, is a mythical figure, that appeals to our sense of what is right and just. We all want to believe in someone who will fight for the underdog. A Hobbit, if you will. Unfortunately the message has been missed. Robin is us! We need to fight for our own rights, not expect someone to do it for us. Glenn, Robin Hood is a character from folklore whose basis is real historical records of a bandit or bandits named Robin or similar. Jesus on the other hand, whether or not you believe he was the son of God, was a real person and his existence is backed up by enormous numbers of documents from the time. So, both have real origins, but it's up to us to determine what message if any to take from either or them. I'm amused at the juxtaposition of the phrase "historical accuracy" with an image of the BBC's Robin Hood, where Robin and his Merry Men wear suspiciously hoodie-like attire, Maid Marian is some sort of ninja, and everyone drops references to the war on terror like anvils. In a way, this proves the article's point - that Robin Hood, like a lot of folk/mythic heroes, is used as a canvas on which to project contemporary concerns. I'm convinced the Robin Hood legends began as a morale-boosting Anglo-Saxon response to the Norman invasion, conquest and occupation of England. The tax collectors (sheriffs had real power to enrich themselves), barons, castles and so on must have been hated; some Saxons may have tried, or been forced, to hide themselves away in wild country. Stories of a champion of the underdog who rights wrongs and outwits the Norman masters would have been irresistible. Robin Hood has always been my hero. As a child I saw him as a role model to what a man should be like. Later in life I appreciate more his justice and empathy. Yes it's all myth, but is that any reason we should not aspire to the qualities of Bilbo or Captain Kirk? The real trouble with the Robin Hood legend is that it is not only fictional, but based on historical inaccuracies. There was no Sheriff of Nottingham when Robin was supposed to be redistributing all this wealth. But it is all good fun, and I still prefer Errol Flynn's version. That sword fight with ex-Olympic fencer Basil Rathbone was absolutely marvellous.